A recent article in PYMTS.com noted new and “sophisticated” technology that’s changing expense reporting: OCR & HTML readings of hotel receipts. While it’s true that businesses should be leveraging this technology, it’s also important to highlight technology that isn’t relatively old news (since we’ve been doing it for a while). True sophistication is in level 3 data, which is what we should be expecting as we move into the third month of 2017. Level 3 data is one level above what’s known as level 1 and level 2 credit card data. When you make a purchase with a credit-card (or a P-Card), data about that purchase is sent to the credit card company. Level 1 provides details about basic transactions, such as how much the total was and when the transaction took place. 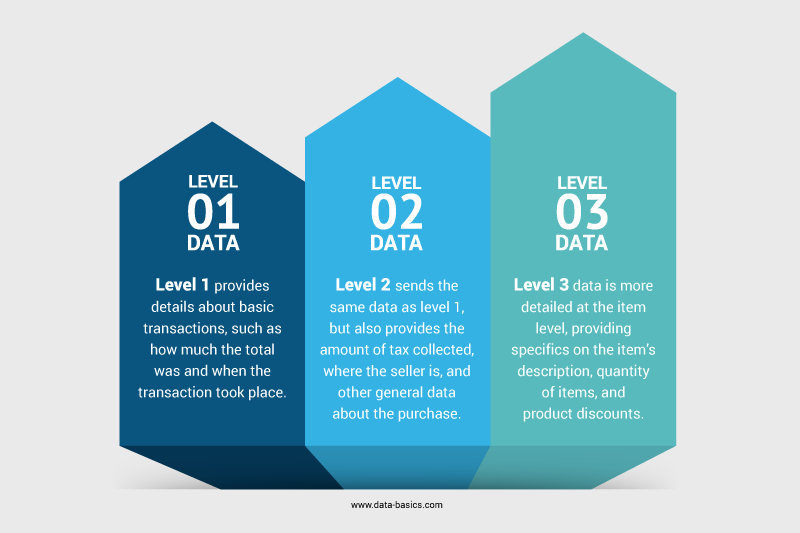 Level 2 sends the same data as level 1, but also provides the amount of tax collected, where the seller is, and other general data about the purchase. Level 3 data is more detailed at the item level, providing specifics on the item’s description, quantity of items, and product discounts. What’s surprising about level 3 data is that, while it provides more data to credit card companies, it actually costs the merchant less than level 1 and level 2 data because the credit card fees are charged at a lower rate. For example, level 3 data currently costs 1.80% + 10 cents while standard processing fees are charged at around 2.95%. With the increased information provided by level 3 data, expense reporting becomes more accurate than ever before. For example, because a total hotel bill encompasses more than just the nightly rate (but also mini-bar charges, laundry charges, restaurant charges, and even the fee for stealing the bathrobes), level 3 data about each item can now be parsed and implemented into an expense report so that the company knows how much is being spent on each item. Plus, while we love OCR and we know that parsing HTML email receipts is helpful in reducing the work of filing an expense report, those aren’t fool-proof systems. The manual data entry is done for you, but you still need to make sure that the correct data has been entered. This becomes more complex when OCR is reading a complex hotel bill and might not understand what information is appropriate to expense. More complications come from the fact that, should a travel assume that since OCR did the work that means that it must be correct, errors in reimbursement can cost the company a lot of money, not only in reimbursing for items not covered by the travel policies, but also in trying to correct any errors by backtracking to make corrections. Level 3 data prevents errors and ensures compliance with company travel and reimbursement policies. The obstacle is that not every vendor provides level 3 data to credit card companies because making the switch (while worthwhile in savings in the end) takes work. Luckily, it’s becoming more standard, so we will soon be able to expect expense reports to do more. For more information on the DATABASICS End-to-End Expense Reporting Solutions, contact us, or call (800) 599-0434.